When most people hear the words “spring break,” they picture a week of fun in the sun with some wild parties. However, if you are a solo parent during deployment, the words Spring Break may fill you with dread. The kids are out of school for a whole week? Without childcare, how will you get any work done? What are they going to do all day? It’s ok, solo parent, you’re going to get through it! 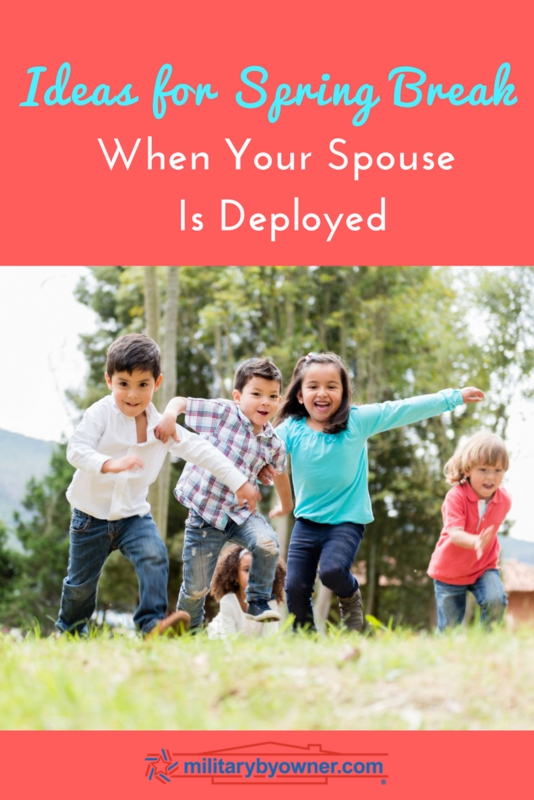 I’m a mom of four young kids who has been a solo parent during many deployments. The last two have included spring break, winter break, and summer vacation. *shudder* While you may not be able to enjoy a Caribbean vacation while your spouse is away and you’re the only one taking care of the kids, there are lots of ways to have fun and enjoy the week together. 1) Think small and local. OK, so deployment is probably not the time to try flying with kids to take a vacation. But if your focus is on bonding with your kids and creating fun memories, you can do that from the comfort of home. Think of it as a “staycation.” My kids are happiest when we all have one thing to look forward to each day. Depending on your children’s ages, think of little activities that are out of the ordinary, but something special they will enjoy. It could be a picnic lunch, a bike ride, a visit to a special park, a day at the Children’s Museum, or a trip to the base bowling alley. If they are older, ask them to brainstorm some ideas. Use this as a chance to cross off some “bucket list” items for your area. 2) Use your military discounts. Your base ITT office (Information, Tickets, and Tours) has tons of brochures for local activities, plus military discount tickets to attractions all over the country. Whether you want to take the kids to the zoo, a history museum, or on a whale-watching boat tour, stop by ITT first to learn the best deals. You can also visit Blue Star Museums for free when you show a military ID card. Officially, the free admission is during the summer months, but many locations offer the discount year-round. Visit their website to find a location near you. 3) Check out the YMCA. If you’re a working parent, you may not be able to take the week off. Your local YMCA probably offers day-camp all week long, and most locations provide a military discount. Your kids can enjoy activities like sports and dance or they can participate in themed camps all about Legos or robotics. No YMCA near you? Look into the county Parks and Rec programs, which have similar camps and sometimes provide military discounts. Whether you live on base or off, your local library is a great resource for kids. Not only do they have books, but there are also activities like Story Time or crafting classes. The kids can pick out a few DVD movies to watch later. Library visits are always a happy time in my house because it’s the quietest day of the week—everyone curls up with a book all afternoon! Depending on the weather, this might be the perfect time to visit a state or national park. Look up easy hiking trails for the kids or bring the bikes so they can ride on a paved path. Check out the Junior Ranger program. Do a scavenger hunt to make it exciting. If you’re nervous about doing a hike on your own with kids, then invite some friends to go with you. More hands and eyes will make it safer for everyone. Pack plenty of trail mix, and don’t forget the water! 6) Set up play dates. When my kids are out of school, they still want to connect with their friends. At least once during the week, arrange time for them to play with a friend. It could be at your house or the friend’s house. Or maybe you all meet up at a local playground or trampoline park. Either way, they will burn off energy and have fun with their friends, giving you some time to breathe for a few minutes. Having your kids home all day, every day, can be a challenge for any parent, but it's particularly difficult for a solo parent during deployment. Don’t expect your house to stay clean. It’s okay to use paper plates if you get behind on dishes. Plan out some easy dinners ahead of time, so you have something to pull out of the freezer on a busy day. Snuggle up for a simple pizza/movie night. If you’re a solo parent facing Spring Break during deployment, don’t stress. You’ve got this! It may be a loud, busy, and exhausting week, but you’ll get through it. And if you’re still dreaming of that tropical beach vacation, then try planning it after Homecoming!